Saddle Stitcher Cover Feeders Produce Letterpress Quality Scoring with our Spine Creaser! Your saddle stitcher's cover feeder could be costing you money. This Spine Creaser video demo shows how you can totally eliminate separate press and die scoring operations or outsourced creasing of book covers. 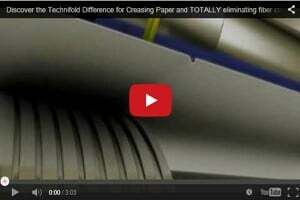 Eliminates fiber cracking regardless of grain direction. Typically installs in 30 minutes or less.